Review on the latest issue of this epic series..
Notes: The latest issue in a monthly series, going on hiatus until later this year. This story of galactic fantasy and drama carries on. But now, we have some plot-lines converging and concluding. A turning point for all.. So, comes an end to a long story arc. 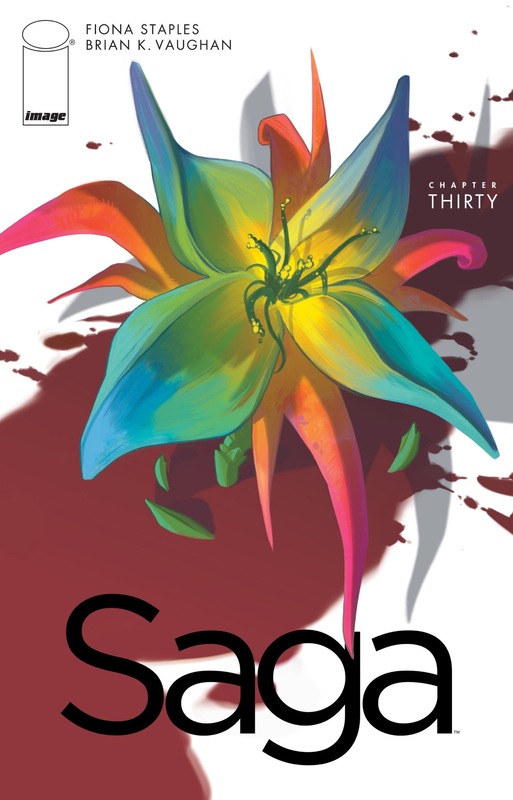 A saga within the Saga, gives us much to breathe about..
First, being that the current arc has been a roller coaster of emotions and deadly danger. There has been much raw fear and heightened stakes to process in reading, as we have read through psychotic murderers, gigantic beats, disasters. Many of such, resulted in the sudden death of characters some readers may have felt some attachment to. Also, there are mature themes unnatural to our usual sci-fi fantasy dramas, including drug abuse and child abuse. The last six issues have been the heaviest of the six-issue groups so far, as readers to the trade paperback collections will also find out. 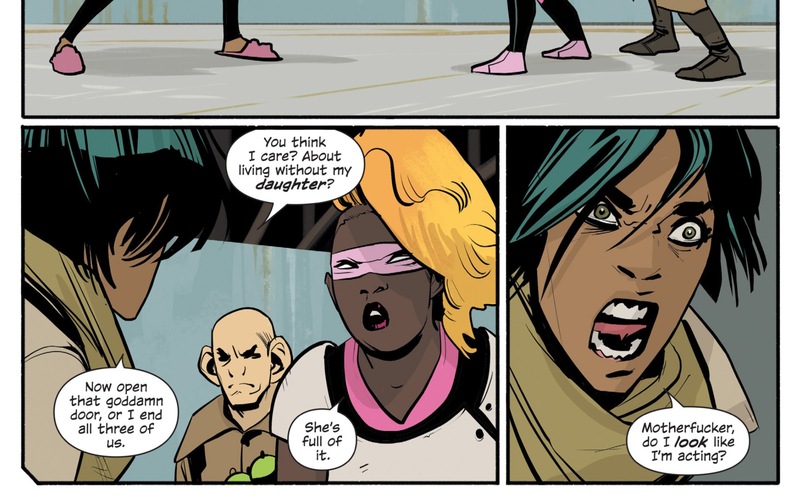 For this issue, we also have a deeper fear for Alana, as even with the death of the Last Revolution’s leader, still fights difficult opposition to get her child back. I love this particular defining moment.. Unfortunately, this situation does not go the way she wants..as a sudden turn of events drives mother and child further apart. The dilemma is aggravating, but drives the story into a curious new direction for Hazel, soon made clear on that last page. It will be a while before we go on, so I like this moment of last page acceptance for flashing forward and not turning back. But until then for the duration of this issue are many glorious reunions. 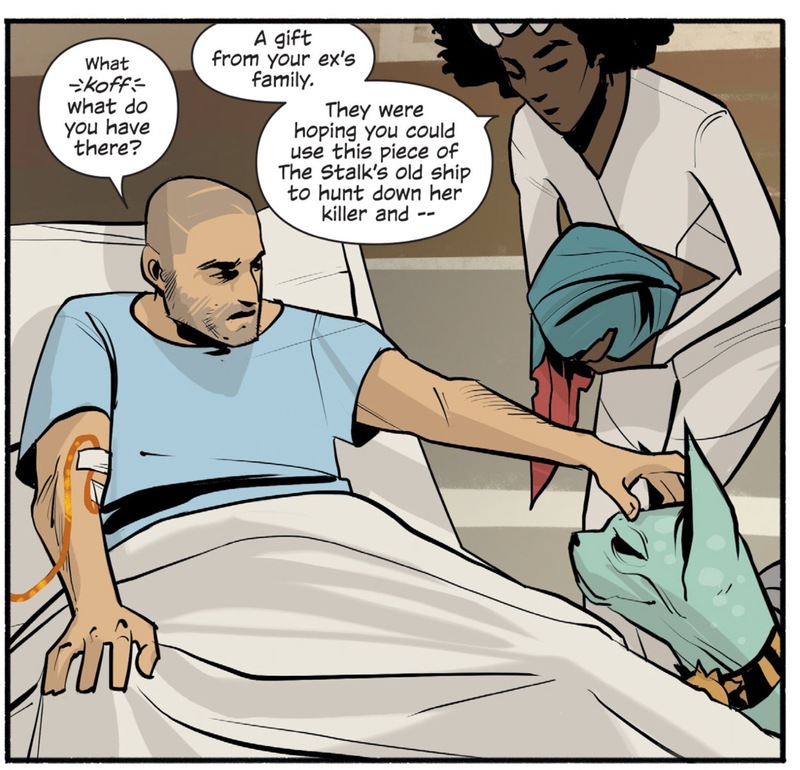 Marko comes back to Alana, at the most important time for here, in a time of sudden loss. The frustrations of what led to their separation are forgotten for now, as they understand there are greater things of importance..each other and Hazel. Together, there will be strive for a happy end for Hazel. Prince Robot is also reunited with his child, which is somewhat bittersweet. He also reunites with Dengo the kidnapper, who also murdered the mother of his child. There is no mercy for what comes next, which comes as almost satisfying. I enjoyed Dengo’s character, but feel that such actions he took deserve such reactions. His time has come. We also finally get the return of The Will, as he is finally cured but at great cost. Also, happy to see The Will and Lying Cat reunited. This brings a smile to my face.. But we get a little anguish there as well, as Sophie delivers sad news. I think she is still very sorry.. So now, we come to a stop with a curious end on where the Saga goes from here. Some time has passed, and may perhaps pass some more. It’s a good chapter break, for us readers to catch our breaths and go outside. Enjoy times with our loved ones, or go on a hike. Let our times also pass before we move on with the story. Just be careful out there..especially around dragons.